Electronics USA loves LED Display technology! 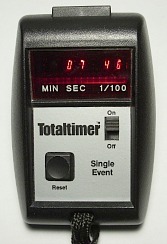 We have been acquiring these unique vintage LED stopwatch timers for those of you who may enjoy them. Yes, these are for sale, and they compliment our current line of stopwatches very nicely. They are vintage and now approaching 40 years in age. But, they are VERY high quality, USA made, extremely rugged, and still very useful. They are used, of course, but the good news is we have tested them and offer a 90 Day Return Only Warranty. Operation is simple and easy to use - please check the details for each model below. LIMITED SUPPLY. These timers use super cool miniaturized LED displays with bubble lenses to magnify them for easier viewing. Be sure to scroll down to check out our video on these types of displays and timers. Very simple operation: turn it on, press reset, press the start stop button on the top, press it again to stop timing. To reset the display to zero, press reset. Lanyard included - this is for hanging around your neck. A great vintage technological collectible from the 1970's that is still quite useful and fun to use! Call Us for current availability. We usually have a few. Simple to use: turn it on, press reset, press the start stop button on the top, press it again to stop timing. To reset the display to zero, press reset. A cool vintage technological relic from the 1970's that is still quite useful! Basic Timing: turn it on, press reset, press the start stop button on the top, press it again to stop timing. To reset the display to zero, press reset. 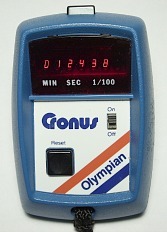 Split timing: turn it on, press reset, press the start stop button; successive presses of the start stop button will display elasped time from the previous press. 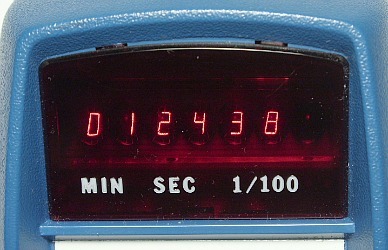 The DISPLAY button releases the LED display to show current running time. 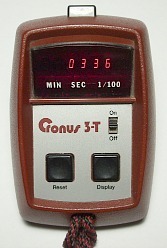 The 3-T is an early example of an "advanced" stopwatch for its time, and a great tech collectible! Contact us for current availability. Vintage: Mid 1970's. We estimate this is an ealier model because the case is a little less refined, and the rear label says Intersil Corp., which was a major timing chip manufacturer from this era. 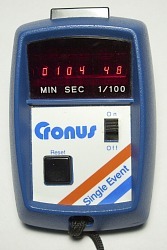 We believe Cronus was a brand name that Intersil created to sell their stopwatches. Simple to use: turn it on, press reset to zero the display, press the start stop button on the top, press it again to stop timing. To reset the display to zero, press reset. A nice "high tech" collectible from the 70's! Contact us to check stock on this item.